NIB - Converse - Infant Girls Light Aqua Sneakers Size 4. Condition is New with box. Shipped with USPS Priority Mail. Hi thanks for looking at these. They are really fun sneakers and a great color. They are brand new. I purchased them and she was a super late walker. I kept hoping I would have an opportunity to use them but the softer shoes were better for her at the time. Hope someone can use them at a discount and I can buy her similar with the money in her new size! New in Box! 2 Pair of Converse Chuck Taylor Baby Booties. • Size 0-6 Months. Brand new in box. Size 5, these shoes retail for $35! Velcro on both sides of shoe as well as elastic in the middle underneath flap. The top of the toes on each shoe have a flap that lifts up to reveal an engine. Converse Chuck Taylor Infant Hat and 1 Pair of Slip On Booties. Size 0-6 Months. Converse Chuck Taylor Infant Bib and 1 Pair of Slip On Booties. Size 0-6 Months. Converse all star, cute booties. 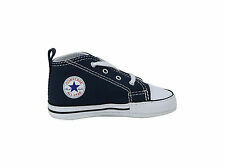 New in box: Converse Infant Booties for boys, size 0-6 months. I did not want to open box, so I took lots of pictures. I am not affiliated with Converse. CONVERSE Baby Pink Hi Top Shoes. Condition is New with box. Shipped with USPS First Class Package (2 to 3 business days). Box has been bent slightly but still in very good condition. Shoes never worn. See pictures. Message with any questions. 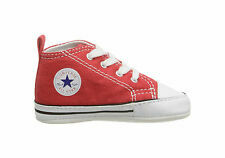 You are buying a Converse All Star 2 Pair Infant Crib Booties red & White and a grey and white~Sz 0-6 Months. Color may differ slightly due to lighting. 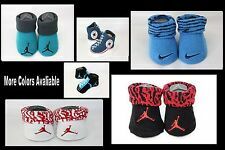 Size Infant/Toddler size 10. Condition: This item is in Good Condition! Overall This Piece Looks Great and you will love it at a fraction of the price! We are only human and may make a mistake once in a while. Handmade crocheted booties. Many colors/sizes available. 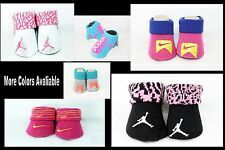 Adorable affordable Baby booties. Size 3-6 months. Converse Chuck Taylor Shoes . From the Converse Slip On Collection. Infants size 7. For your consideration is a New pair of. New in box. Up for sale ~ Two NEW Pairs of boy CONVERSE Baby Booties ~ 0-6 Months. NEW in BOX. Just taken out to photograph. Toddler converse shoes size 7. Condition is Pre-owned. Shipped with USPS First Class Package. Preowned Toddler velcro black Hi-top Converse, size 10(US). Good condition. The Converse chuck taylor first star sneaker recalls the iconic original for little feet with a canvas upper and comfortable lace-up design witha velcro closure. Loc: 135 HD3. Don't miss your opportunity on this item; if you decide to buy later it might be gone! 2 Pair Converse Chuck Taylor 0-6 Months Baby Booties Infant Blue White Gift B6 M. Condition is New with box. Shipped with USPS First Class Package. NEW in BOX. Just taken out to photograph. Up for sale ~ Two NEW Pairs of CONVERSE Baby Booties ~ 0-6 Months. NEW in BOX. Just taken out to photograph. 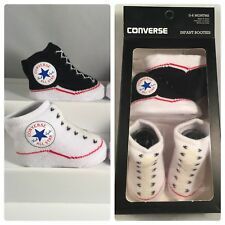 We are offering this adorable pair of baby Converse booties. - Size is 2. - Color is pink. - New with box. - FREE SHIPPING !!!!! (within the USA) - R. If you have any questions please feel free to contact us. Also, look under the "About the Seller" area and click the "Seller's Other Items" tab to see our other offerings. We thank you for looking at our listing. We make every effort to disclose any flaws, tears, stains or holes. Also colors vary on monitor settings. These shoes are new with the box. 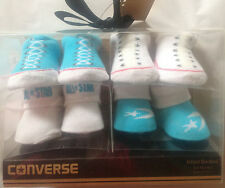 New in sealed box Converse All Star infant booties size 0-6 months. 2 pairs: one pair blue, red and white and the second pair is solid off white with the word “converse” on the toes. If you have any questions please message me! Thanks for looking!